French Bulldog Profiles – It's the Mae Mae! We luv ya, Mae – and it looks like your new mommy loves you, too! https://i0.wp.com/www.bullmarketfrogs.com/wp-content/uploads/2015/04/Brindle_pied_frenchbulldog.jpg?fit=662%2C662 662 662 frogdogz http://www.bullmarketfrogs.com/wp-content/uploads/2015/06/bullmarket-logo.png frogdogz2008-05-30 22:25:082008-05-30 22:25:08French Bulldog Profiles - It's the Mae Mae! Meet Chef, son of our lovely brindle girl, Paris. Paris resides in Traverse City, Michigan, where his mom is busy organizing the first annual Traverse City French Bulldog walk. You can learn more about it by joining the TC French Bulldog group, over on Ning. This is Chef…Paris’s baby. He’s a year old now. He loves to chew anything hard…his favorites are old tupperware and OJ containers. Needless to say, he has VERY white teeth. French Bulldog Profiles – Toblerone! Meet Toby, short for Toblerone! Here are some photos of the little guy – isn’t he cute? https://i0.wp.com/www.bullmarketfrogs.com/wp-content/uploads/2015/04/Brindle_pied_frenchbulldog.jpg?fit=662%2C662 662 662 frogdogz http://www.bullmarketfrogs.com/wp-content/uploads/2015/06/bullmarket-logo.png frogdogz2008-05-27 19:41:462008-05-27 19:41:46French Bulldog Profiles - Toblerone! 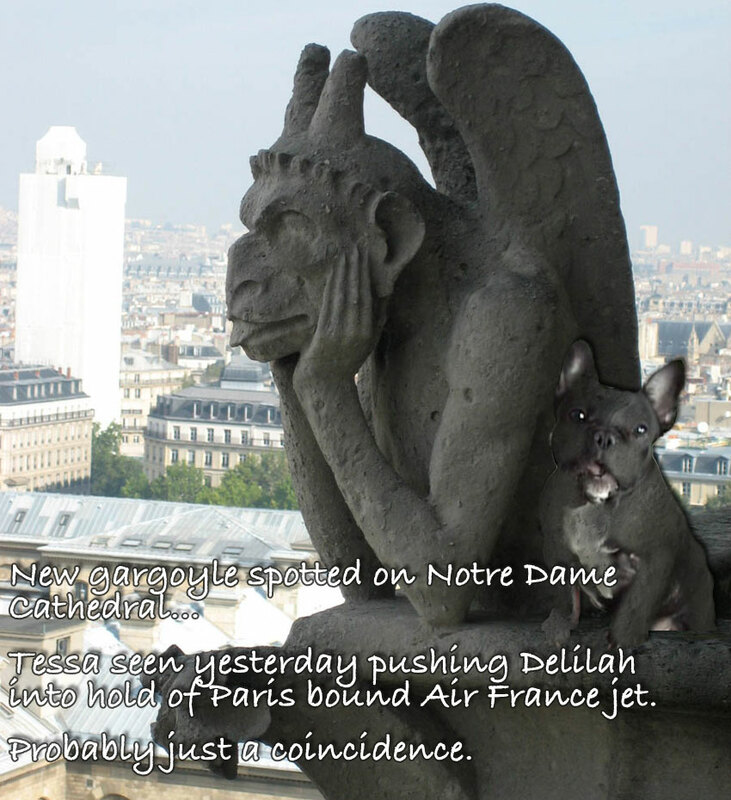 French Bulldog Profiles – Chaos in Michigan! Meet Chaos, which is short for Chaos Reigns Supreme. Chaos lives with his mom, Laura Nagel, in Michigan. I have a 10 month old Frenchie that I purchased through a breeder in Georgia that I honestly didn’t know a lot about. After seeing a picture and later a short movie of my boy, there was nothing that was going to keep me from him. He was already 3 months old when I got him and he immediately took over my quiet life. I have been married without any children for over 12 years and have always had pets, but Chaos is something else. Technically known as “Chaos Reigns Supreme” his name couldn’t be more suiting. The energy and happiness with which he exists is exactly what I needed at this point in life. A quick learner and avid pleaser training has been a breeze begging with potty training (bell training) being complete in a little over 2 weeks. He is a social bug and we take him everywhere with us. He listens so well that we don’t even put him on a leash. I know that he does not conform to the breed standard very closely, but his health is wonderful and that is what really matters to me. He and his mean cat brother play without regard for anything around them and the session always ends in an energetic race throughout the house and between the furniture which we affectionately call the “frenchie 500”. The pictures will explain it all! https://i0.wp.com/www.bullmarketfrogs.com/wp-content/uploads/2015/04/Brindle_pied_frenchbulldog.jpg?fit=662%2C662 662 662 frogdogz http://www.bullmarketfrogs.com/wp-content/uploads/2015/06/bullmarket-logo.png frogdogz2008-05-26 03:54:092008-05-26 03:54:09French Bulldog Profiles - Chaos in Michigan! Luisa’s post on “How to create a dog that will bite somebody” is pure genius, and frighteningly accurate. Best part (worst part?) – Her photos of a ‘killer pit bull’, incarcerated in Texas for killing a child. It is to weep, honestly it is. If you’re not already despairing enough, go and read this post, on the caveat blog, about why the fight against breed specific legislation is everyone’s fight – from spaniel owners to Golden owners to cat owners. Do something about it, today – before it’s too late.Consider this – French Bulldogs? Those cute little dogs that look so silly here on my site, and in your lap? They’re on the banned list in a lot of cities already, and the ‘about to be banned list’ in even more, including the province of Ontario. Still think this isn’t your fight? OK, here’s the picture. Click for full(er) sized.